1. List the Name to be embroidered. 2. Color of the Fabric on the Name Tag. 3. Color of the Thread on the Name Tag. If you are purchasing the Easter Basket without Name Tag - please write No Name Tag. Current / Turnaround time for the Easter Baskets - 1 to 2 weeks if purchased without Name Tag - add another week if Name Tag Option is purchased. Purchase by April 13th to insure the basket with No Name Tag Option will arrive by Easter - US Buyers. ● This super cute fabric basket can be used for so many things during the Easter holiday. Candy Basket - Gift Bag – Centerpiece for the table and even hold Towels / Tissues in the guest restroom. After Easter – take out the grass and it will be a perfect tote for your little one. ● Your little guy or gal will love hunting for Easter eggs with this special basket!! 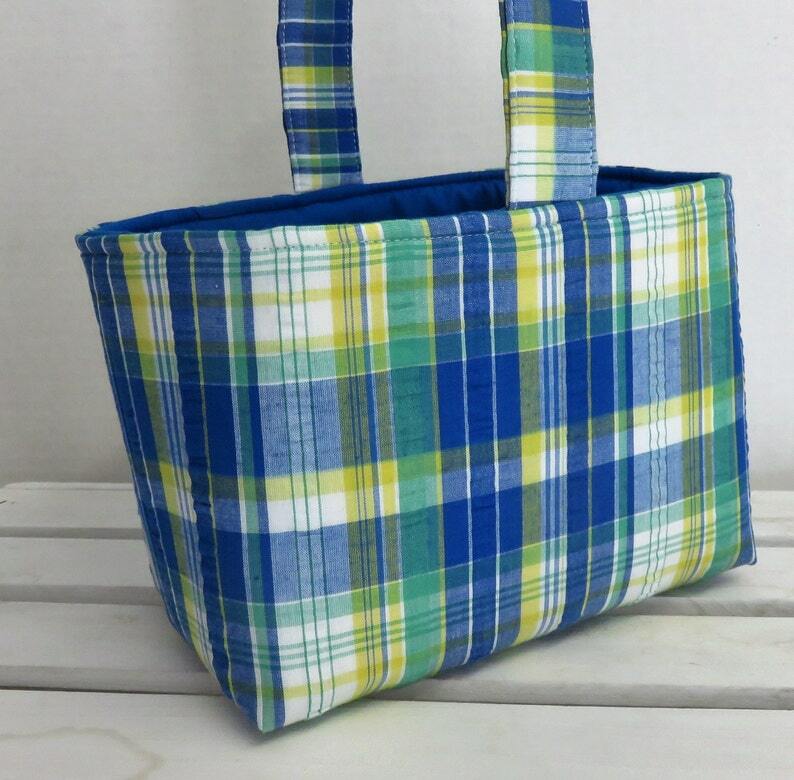 ● Blue Green Yellow White Preppy Boy Madras Plaid fabric. ● Royal Blue cotton fabric for the lining. ● Embellished with grosgrain ribbon bow tie accent and tulle. Easily removable if you wish. Ribbon & embellishments can vary slightly from photo. ● Use the drop down menu to choose "Personalized Name Tag" when checking out. ● Use the drop down menu to choose "Font" when checking out. ● Personalized Custom Oval Name Tag - measures approximately 4" x 2". Adorable Easter basket for our newest addition! Thank you! This bag is so well made! I absolutely adore the shape and the fabric! !